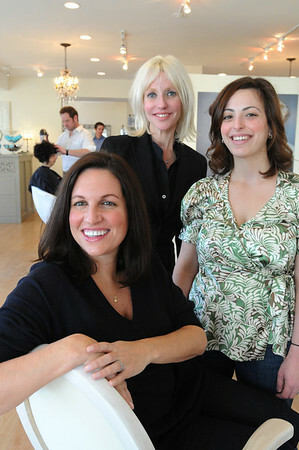 From left, Kathy Glabecki, owner of Chakra personal training boutique, her sister Kerry Callahan, La Belle Femme's owner, and Sara Pouladian, a bride who went through the businesses' combined Bridal Boot Camp. They are at La Belle Femme. Photo by Ken Yuszkus/Salem News, Friday, February 5, 2010.